Home / Understanding Order Types / How Stop Loss works? Stop loss order is typically used as a closing order to limit losses or lock in your profits on a long or short position. But they can also be used to open a position. Stop Loss: Triggers a next order type when the last market price hits the stop price. Next order can be Market Sell, Limit Sell or Trailing Stop Sell. A stop-loss is designed to limit an investor’s loss on a security position. Setting a stop-loss order for 10% below the price at which you bought the stock will limit your loss to 10%. For example, let’s say you just purchased BCH at 0.11 BTC. Right after buying the stock you enter a stop-loss order for 0.09 BTC. 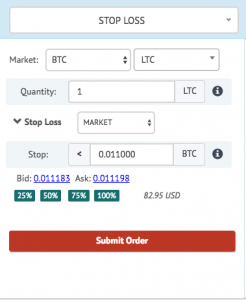 This means that if the stock falls below 0.09 BTC, your coin will then be sold with next order type. The advantage of a stop order is you don’t have to monitor on a daily basis how a stock is performing. This is especially handy when you are on vacation or in a situation that prevents you from watching your stocks for an extended period of time. The disadvantage is that the stop price could be activated by a short-term fluctuation in a stock’s price. The key is picking a stop-loss percentage that allows a stock to fluctuate day to day while preventing as much downside risk as possible. Setting a 5% stop loss on a stock that has a history of fluctuating 10% or more in a week is not the best strategy. You’ll most likely just lose money on the commissions generated from the execution of your stop-loss orders. There are no hard and fast rules for the level at which stops should be placed. This totally depends on your individual investing style: an active trader might use 5% while a long-term investor might choose 15% or more. Select Stop Loss order type. Select Base and Quote coin. Select the number of coins needs to be sold. Now, click on the drop-down menu near Take Profit. It will pop up 3 options: Market, Limit, and Trailing. Selection of an option means when market price (ask price) rises to the Stop value, the selected order in the drop-down menu will be executed (Market Sell, Limit Sell or Trailing Sell). 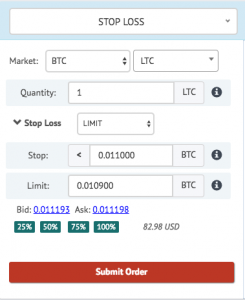 E.g if the current ask price of LTC is 0.011189 BTC. Stop value can be a place at 0.011000, ~2% below the current price. Market Sell: A Market Sell order will be placed. Limit Sell: A Limit Sell order will be placed having limit value mentioned during placing the order. 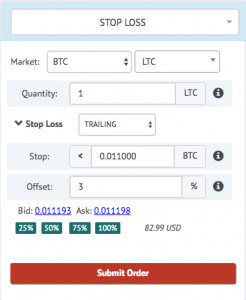 Trailing Stop Sell: A trailing Stop sell order will be placed with the mentioned offset during placing the order. Caution: Stop price should be a less current market price (ask price). Suppose the current ask price of NEO is $100. Now someone placed a Stop Loss with Market Sell order, for 1 NEO coin with stop value $90. Now when the NEO ask price dips less than or equal to $90, a Market Sell order will be placed. Suppose the current ask price of NEO is $100. Now someone placed a Stop Loss with Limit Sell order, for 1 NEO coin with stop value $90 and a Limit value $95. Now when the NEO ask price dips less than or equal to $90, a Limit Sell order will be placed at $95. Suppose the current ask price of NEO is $100. Now someone placed Stop Loss with Trailing Stop Sell order, for 1 NEO coin with stop value $90 and Trailing offset 5%. Now when the NEO ask price dip to less than or equal to $90, a Trailing Stop Sell order will be placed. Let’s say market bounce back again and reached to peak $116 and then start correcting. The time when the market reaches $112.5, a Market Sell order will be placed. My expectation would be, that when I submit a STOP LOSS – TRAILING order, then the monitoring of the max value (from which the actual stop price is calculated with the offset) starts only after the initial stop price was hit. My observation is, that actually the max value is monitored from the time, when the STOP LOSS – TRAILING order was submitted. Below are the details of the actual trade, where I set the initial stop value to 5.7 and the offset to 1%. At the time, when the TRAILING STOP SELL order was automatically placed (when the price reached 5.7), the stop value was already 5.805657, so a market sell order was automatically placed. Could you please fix this behavior, if this is a bug?